If you're using one of these platforms and still not seeing your older posts being imported, the issue may be that your blog has been configured to syndicate its feed through Feedburner. Due to technical limitations with Feedburner, only about the 25 most recent posts are able to be imported. If you're currently serving your blog feed through Feedburner, and you're blogging with one of the platforms mentioned above, you may want to disable Feedburner in order to allow BlogFeeder to import your older posts. Various blogging platforms have different ways of enabling/disabling Feedburner, and some of the more common ones are described below for your convenience. 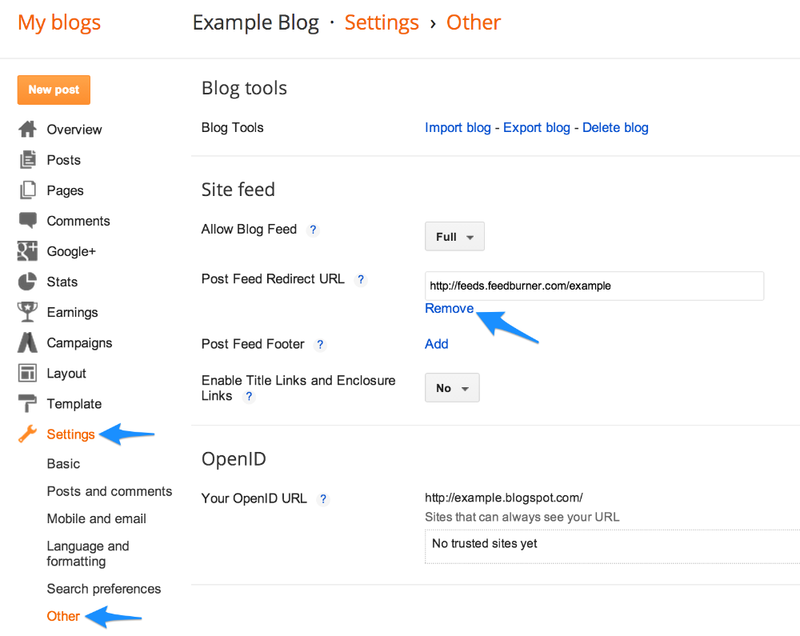 Tip: If you want to both continue serving through Feedburner, and also import all past posts, you can follow the steps below to disable Feedburner for your blogging platform temporarily, log into BlogFeeder and Synchronize the feed, then re-enable Feedburner syndication once the full import is complete. This will allow BlogFeeder to import all previous posts, and once Feedburner syndication is re-enabled, BlogFeeder will continue to import and update the 25 most recent posts, which Feedburner makes available. Click "Remove" next to "Post Feed Redirect URL"